M wanted to get some friends together and go out to eat and frolic. Then she decided that we should stay in instead. And so we did, with sushi take-out from Zento. And we had a hilarious time at R’s fancy pad. M made some japanese cocktail, which was strong, yet good. 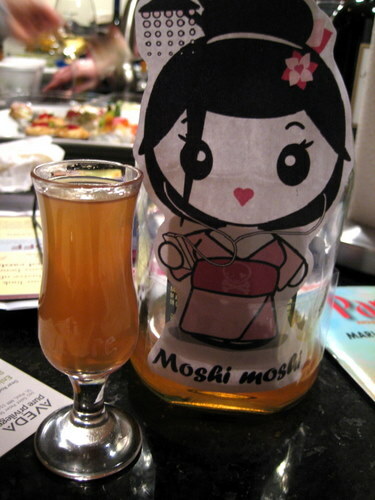 And she even printed out a cute little graphic for the bottle. Yes, she takes her boozing seriously, and is a big time nerd. And we love her for it! I love japanese style green salad, so I insisted that M pick some up. Ooh, I really like Zento’s version. Baby greens, tomatoes, and even asparagus! And the dressing rocks. I got some random japanese treats for this night too, that’s where the peas came from. 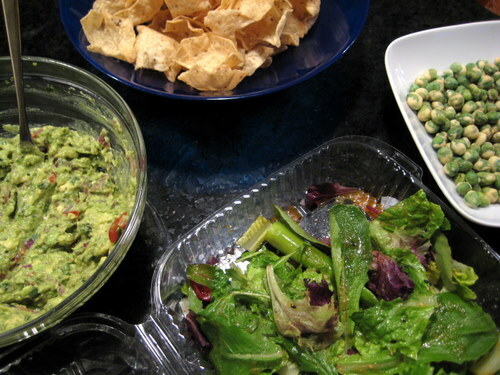 R also made a guacamole. Not japanese at all, but definitely delicious. 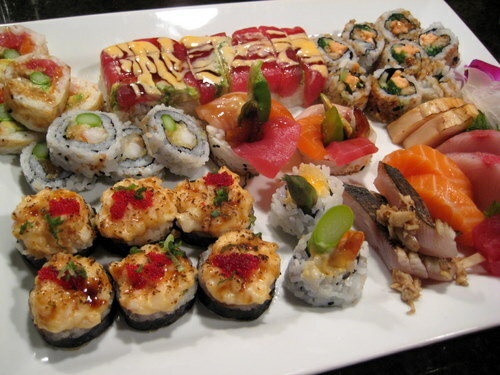 So, what kind of sushi did we get? Take a look! I don’t have a freakin idea what any of these are. I think the one in front was crab related. One of the ones in the middle had shrimp tempura in it. The one on the far right corner has cooked salmon. And we had some fabulously fresh sashimi on the lower right. My favorite was the rectangularly shaped one at the top. I don’t know what this was, but it was beyond delicious and it all just melted in my mouth. Yummy! One of the other random japanese treats I brought over was some green tea daifuku. Daifuku is mochi stuffed with something sweet on the inside. I’ve never actually had daifuku before. I’ve had mochi ice cream before. I thought to myself, heck, how different could this be? Well, I’m used to the mochi consistency and flavor, so I didn’t mind that at all, but the green tea innard is what I did not enjoy. It wasn’t sweet at all. It just had a strange bitter green tea taste. I thought it would be a green tea flavored mochi with sweet red bean on the inside. 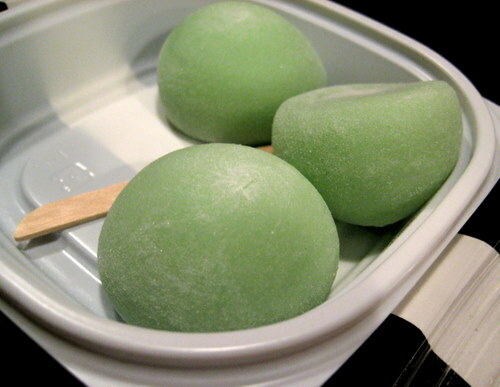 Instead, it was plain old mochi with green tea flavored mush on the inside. It didn’t do it for me. M liked these the most! She got to take the spare container home with her! Oh, it was a fun night. Three red wine spills still couldn’t stop the fun! And I discovered that I am a natural at Wii dancing!